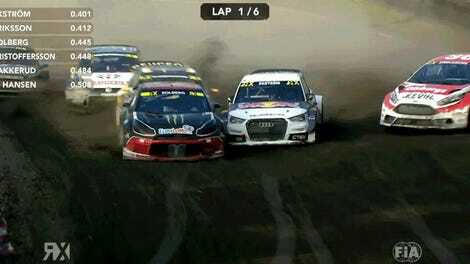 Rallycross is chaos in race form. No body panel is sacred—including the ones on the top of the car. This year’s Red Bull Global Rallycross finale at the Port of Los Angeles featured a car straight-up landing on top of another car while locked in intense battle. Joni Wiman’s Honda was trying to take the inside line next to David Higgins’ Subaru as they approached a 70-foot dirt jump that moved into a left-hand curve. Wiman tapped Higgins when Higgins ran wide ahead of the jump, and then landed on top of the side of Higgins’ car on the other side. That’s right: on top of Higgins’ side of the car. Fortunately, Higgins is an eight-time Rally America champion, so I’m sure he’s seen much worse than just another car up in his space. 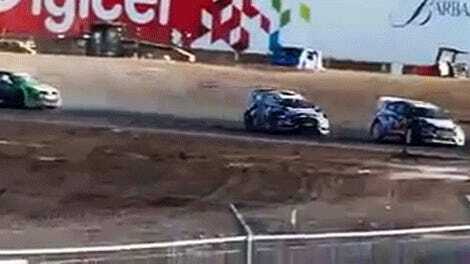 Either way, thank goodness rallycross cars are built tough.